When a new iOS version comes out, developers can get pre-release Beta Versions to test their apps. New betas can be installed over the air, but if the release version comes out then there’s no over the air upgrade for those. Instead, it appears that you already have the latest version installed – even though it’s not the release version. At the same time a Release goes public, previous Betas expire – requiring them to be replaced on the iOS device in question. The same procedure goes if a new Beta is released. This will put your device into recovery mode, and even though it’s a rather distressing process, if all goes well no data is lost in the process. Sometimes I’ve encountered that my device STILL can’t activate after doing the above. If that’s the case, repeat the above, Option-Clicking on Restore. 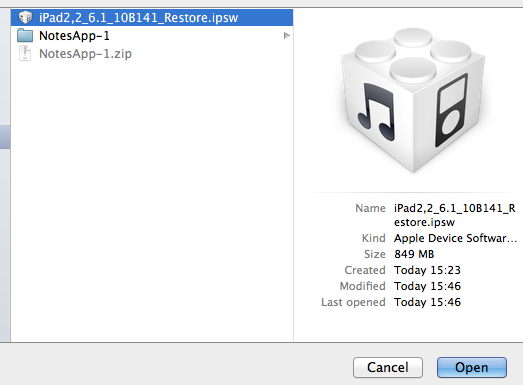 This will also let you choose the .ipsw file, however it will erase all your data. You can choose to click Restore without Option, which will download the latest firmware for you.